Psychic Kids and Intuitive Children | Take on the Role of a Lifetime! Kids Who See Ghosts Is An International Bestseller! Posted by coachingparents in Dr. Caron Goode, intuitive children, Intuitive Parenting, Intuitive Tools, near-death experiences, Seeing Ghosts, Yvonne Perry. It is very common for young children to see ghosts, but this ability usually fades as the temporal lobe in the brain develops and the child learns that talking about seeing spirits is not well received by peers. However, one group of kids on my raising intuitive children blog are teenagers who are still seeing ghosts. Some of them are depressed and scared because they have no one to talk to or help them understand what is happening. They worry that there is something wrong with them. Their parents don’t know how to help them either. Therefore, I’m teaming up with Yvonne Perry as a collaborator and guest writer on this blog hoping that together we might have some answers for the kids and parents. Yvonne, now a grandmother with a psychic grandson about whom she has written a book to help kids and parents understand psychic gifts, saw and sensed entities around her when she was a child. As her brain developed, either the temporal lobe did not close off the third eye ability or her near-death experiences (NDE)—the first at age 9—reopened it. As an adult, Yvonne continues to sense spirits around her. 1. Seeing ghosts or seeing into the other realm is associated with a brain wave state. 1. Brain wave states fluctuate all the time and are prone to stress. Adrenalin, NDEs, emotional trauma, and the temporal lobes and activates “visions.” Surgery requiring anesthesia may alter brain wave state thereby opening a door in time or lifting the veil between worlds. 4. Psychic kids are talented intuitives with gifts to share with humanity. They may have a divine mission as a prophetic voice or medium. Intuitive children can who see ghosts consistently need to make some concrete decisions about their relationships to ghosts. We will be discussing the need and how to set psychological and psychic boundaries. It is our goal to help teens learn more about their sensitive nature and empathic ability. So, stayed tuned to this blog. Posted by coachingparents in Dr. Caron Goode, intuitive children, Intuitive Tools. You’ve read many times on this blog and in my books, that I believe everyone is intuitive regardless of background. I’m not saying that everyone has the makings of being a psychic medium, but we are all born with a varying degree of intuitiveness. I’m sure you can think of a time when you have experienced an inner knowing, voice, vision, or feeling that instructed you not to go in a certain direction, or to make a particular selection, or perhaps you knew when someone was lying to you. While we are born with intuition, we can choose to either shut it out and ignore it or listen to this guidance and allow it to become clearer. By choosing to develop your intuition, you can gain insight into daily situations and make more informed decisions throughout your life. Grounding. Electricity always needs to be grounded in order not to overload. We have an electric field around us that is our personal energy. It can be grounded to the Earth through walks in nature, working in the garden, or visualizing a cord of light extending from your feet into the Earth. Meditation. To find your intuitive self, you have to be alone in order to get to know who you are, but many times we are too busy to tune into the inner voice of guidance. Meditation or silence allows us to hear our intuition. A lot of people think meditation is a state of not having any thoughts but the idea is to let the thoughts come and go without being attached to them. You will know when you have tapped into higher wisdom. The goal in meditation is to let go and just be. Conscious breathing is very balancing, calming, and beneficial. It refreshes every cell in our body as we take in oxygen. Five minutes of deep breathing while counting your inhalations and exhalations can help restore a sense of calmness and regulate the heartbeat. Controlling and counting the breaths develops the concentration and focus needed to manage mental noise. Do this while sitting in a comfortable position with your spine straight. Writing or journaling allows us to clear our minds of distracting thoughts and get down to what is really bothering us. This is when we can begin to see the solutions that come from within. Before beginning your writing session, light a candle and ask for guidance. Then, write whatever comes into your head. You may be surprised at what you read later. Yoga is one of the best modalities because it incorporates grounding, centering, breathing, and exercise while connecting with the Divine. Even if only for a few minutes, this will help open the chakras and refresh your mind and body. If you wish to find your intuitive self, begin to nurture your body, mind, and spirit. Your time and attention to the spiritual aspect of who you are will bring forth the knowledge of your inner self. Posted by coachingparents in Dr. Caron Goode, Psychic Kids. We all have telepathic abilities and use this method of communication to send messages even when we are not aware of doing so. You think of an old friend that you haven’t connected with in years and in the next day or so you get an email or phone call from them. The two of you connected telepathically and this mental “signal” brought about an urge to take action and connect physically. According to the books written and my interviews with children, the crystal children, born in the latter part of the 1990s, are very telepathic and intuitive beings who have a pure crystalline energy. Having such keen and natural telepathic abilities, Crystal children communicate with one another very easily. But when it comes to communicating with adults, these spiritually-advanced souls may be misunderstood or even diagnosed as autistic because some of these kids delay talking until they are three or four years old. Since sound is very important to Crystal children the child may communicate by singing, humming, or intoning without intelligible words. They may also use their own form of sign language. And since this type of communication is mind-to-mind, it demands honesty—you can’t lie to a Crystal kid! There is no coincidence that as this multitude of Crystal children are born, that adults are experiencing a shift in consciousness and becoming more aware of our intuitive thoughts and feelings. Already many of us are getting in touch with our psychic abilities and ask for inner guidance before making decisions. Human interest in the paranormal is at an all-time high, accompanied by books, television, and movies on the topic. Crystal children are helping usher in a new world and bring to us a level of kindness and sensitivity we have never experienced. I see this new world coming into existence as more and more of my clients are listening to their intuition—that small voice inside that tells them there is more to life than feeling stuck or overwhelmed. Recognizing their responsibility for what they are unconsciously creating through thoughts and actions, they are done with being depressed, stressed, unhappy, or living with low self-worth. They are taking decisive action to make positive changes and find happiness, emotional well-being, and more fulfillment in life as they reach toward their full potential. Posted by coachingparents in Intuitive Resources. I’m writing this quick message to tell everyone that TODAY, Tuesday October 5th, is the official launch of the brand new book by Luis Angel Diaz, Memory in the Cells: how to change behavioral patterns and release the pain body. Memory in the Cells is described as being, “an enriching opportunity to immerse ourselves in the exciting world of inner liberation.” Its author, Luis Diaz, has been a holistic therapist and teacher in the fields of nutrition, herbalism, oriental medicine, kinesiology, acupuncture and emotional release methods for almost two decades. After the death of his wife in 1998, Luis experienced a profound transformation, wherein he learned how to explore emotions and pain at a much deeper level than he had ever imagined before. This transformation resulted in the development of the Cellular Memory Release process (CMR) that he explains in detail in the book Memory in the Cells. Posted by coachingparents in Dr. Caron Goode, intuitive intelligence, Intuitive Stories, Intuitive Tools. Our intuition tells us things beyond our everyday perceptions. It tells us what people are really saying, and what their motivation is. Our intuition often tells us what is next, what to do or not to do, and even when other people are thinking about us. Children use their intuition to sense the energy around them and know if a place or person is safe. Intuition can be developed or pushed aside as we become adults. Those who push it aside may still have the gift pop up from time to time. Recently I read a story about a woman who had an intuitive encounter with her coworker. Doris works with Sandy. They have always felt close and confided in one another. One day Sandy told Doris that she was afraid she had breast cancer. Her mom had just passed away from the same thing and now Sandy was experiencing shoulder and arm pain. Doris reached out to comfort her friend. Upon placing her hands on Sandy’s shoulder, she immediately knew her friend did not have breast cancer. Doris intuitively knew that Sandy’s problem was with the rotator cuff in her shoulder. She also immediately knew that Sandy would be required to have minor surgery and would be out of work for a short period of time, but that everything would be ok.
How did Doris know this? She may not have realized it, but Doris “read” Sandy’s energy. Doris has the gift of empathy—or an ability to intuit or sense energy of other people. Intuitive intelligence is an innate part of who we are. It is a very real aspect of our awareness in any given moment. Doris went on to say that although she was 100 percent sure of what she knew, she did not tell Sandy. Instead, she wished her well and told her all would work out well. Doris had not been able to do this before that incident or since. However, she also admitted that she is able to tell if a woman is with child long before she starts showing her pregnancy. And, she said could tell if a woman would ever bear her own child. Obviously, the gift is still within Doris—she’s just not recognizing its various manifestations. It is my belief, my intrinsic knowing, that all of us are capable of tapping into the intuitive gifts that are within us. A gift like this may be dormant or undeveloped, but if you’ve done it once, you may expect that it can happen again. © 2010 by Dr. Caron Goode, the award winning author of Raising Intuitive Children and the international best-seller, Kids Who See Ghosts, guide them through their fear. Dr. Goode is the founder of the Academy for Coaching Parents (acpi.biz) that trains and certifies professional parenting coaches. Reach Dr. Goode for speaking or training at caron30 @ gmail.com. Posted by coachingparents in Psychic Kids, Seeing Ghosts, Yvonne Perry. Death is a difficult subject for adults to understand. Children have an even harder time trying to grasp the concept. That someone they love is not coming back. My grandfather, whom we called Pap, died in 1988. That was more than a year before my brother and his wife had children. Imagine the surprise when their first-born son was about two or three years old and reported that Pap was in his room at night! Being fundamentalist Christians, we did not take well to having spirits messing with our kids. We concluded that this entity could not be Pap for three reasons: 1.) according to the teachings of our religion, Pap was in heaven and could not possibly manifest on Earth; 2.) my nephew was afraid of the entity, so it must not have been a friendly spirit—although my grandfather was quite a jokester; 3.) our family did not believe in ghosts; therefore, they could not visit us! But we did believe in demons so we rationalized that we were under attack. We exorcised the child’s room and forbade the evil presence from coming near my nephew again. Ghosts comply with our requests when we intentionally set strong boundaries. Sadly, Pap did not return. As I look back on that event from a different and non-religious perspective, I should have realized that the visitor was indeed Pap. Since my nephew had never met his great-grandfather, he would not have called the visitor Pap unless the ghost had identified himself as such. Those of us who knew Pap could have embraced the visitation with love and gratitude rather than fear and retaliation. The way we handled this episode caused my nephew to be fearful of the spirit world. My grandmother and I had been visited by Pap’s spirit several times since he had passed. But I somehow dismissed all remembrance of those events when my nephew reported seeing Pap. Our experience conflicted with our dogma. Now, I jokingly say that if your experience doesn’t align with your theology, by all means change your experience! We couldn’t possibly alter our beliefs! Pap loved my brother and me very much and I’m sure he would loved to have known our children. It was only natural that he would visit us and them from time to time just to check in. If your child reports seeing a ghost, validate his experience so he will continue to trust his intuition. There is nothing to fear. In fact, this event can provide the perfect opportunity to bring better understanding about the unseen realm and death. You might ask the child if he knows the ghost’s name. If he identifies a loved one who has passed, find out if the ghost has a message for the family or if there is something the family can do for the ghost. Many times our disembodied loved ones simply stop by briefly to let us know all is well in the afterlife or to see how everyone is doing. If this is the case the spirit visitor will probably leave on its own. However, if the family agrees that the ghost needs to leave immediately and not come back, you can lovingly set boundaries with the spirit. Simply call upon the angels of light and love to lead the spirit to a peaceful place in the afterlife where the soul development can continue. Posted by coachingparents in Dr. Caron Goode, Dreams, intuitive children, Psychic Kids, Seeing Ghosts. Have you ever wondered why some kids (and adults) are prone to taking a stroll about the house during the night? Regardless of age, we are all more open to spiritual exploration during our sleep. Children—especially intuitive children—are easily able to tap into the spirit realm night or day. It’s no surprise then, that an intuitive child when deeply asleep is totally in another zone—an “out of body” experience in which some aspect of the human psyche actually travels to other dimensions. Astral projection and astral travel are common among spiritually-gifted kids. It is important to understand the difference between astral travel and astral projection. Astral travel is a process of projecting the consciousness into visual scenes. In meditation we might call this journeying or visualization. Some intuitives (empaths) may actually feel as if they are in the place imagined. However, astral traveling does not remove us from the physical body. Astral projection is when our astral body actually travels to other places. This mainly occurs while asleep in dream states. The rapid eye movement phase is normally aligned with this phenomena. The person is only aware of the experience if he or she has memories afterward. Although we all have out-of-body experiences from time to time, there are those who can intentionally project their astral body and have a genuine experience while awake. Sleep walking is caused when the astral body is unable to release itself from the physical body. The desire to project will animate the physical body without conscious awareness. A sleep walking person should not be awakened while in this state. Instead, help direct and get them back in bed and allow them to awaken on their own. Yvonne Perry is a frequent guest blogger on this site. Her grandson, Sidney, was prone to sleep walking episodes when he was younger. One night his mother, Amanda, awoke and saw Sid standing at the foot of her bed. She was about to ask him to go back to bed when she realized it was his astral body and not his physical body standing there. Naturally, she was startled and jumped out of bed to check on him. She found him sound asleep in his own bed in his room. This demonstrates astral projection. Our bodies are able to perform automatic functions like walking, drinking, urinating, or driving while having an out-of-body experience. You’ve probably found yourself so deep in thought while driving that you got from point A to point B without not being aware of how you got there. Perhaps you were deep in a daydream while walking and didn’t realize you had crossed the street until you “came to.” I’ve left my house many times so preoccupied with thoughts that I couldn’t remember whether or not I turned off the stove or let down the garage door. However, my body automatically performed these functions while my mind strayed. It’s the same way when you are asleep or having an astral projection or sleep walking. Posted by coachingparents in Uncategorized. 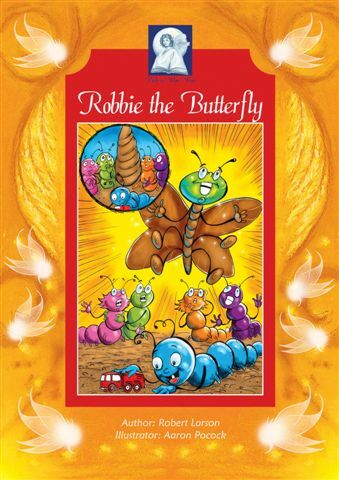 Welcome to Day 8 of Robert Larson’s Blog Tour for his new children’s book, Robbie the Butterfly. The main character is Robbie, a caterpillar who feels like an oddball, gets picked on, and knows there has to be more to the world than the life of doldrums he lives. Robbie is a seeker of deeper truths, which are not revealed until he is teenager and dreams of meeting flock of colorful, happy butterflies. One butterfly speaks to Robbie, and his process of transformation begins. Tweens and teens, who often feel disconnected and alone, will identify with the character’s feelings. Young readers will easily recognize the author’s use of the caterpillar-into-butterfly archetype, and the author gives readers permission to dream and seek answers for themselves. The rest of the story’s characters and representative spiritual concepts are discussed, yet not fully explained or illustrated in the story line. A parent or mentor could be available to follow through on the parable to insure a child’s understanding. Definitely a highly recommended book for parent and child to share together. Author, Robert Larson, is a starseed/lightworker on the path of ascension. His mission in life is to spread the message to the children of the New Earth that being fully present each moment of your life is the key to spiritual transformation. His message to parents out there is to allow your kids to be empowered so they can transcend the wheel of karma and live a life of peaceful non-judgment. He is sharing this message through his book Robbie the Butterfly, which uses the caterpillar to butterfly transformation as a metaphor for the real transformation you go through when you live these truths. Posted by coachingparents in intuitive children, Intuitive Partners, Intuitive Tools, Psychic Kids, Seeing Ghosts, Yvonne Perry. Author Yvonne Perry is the paternal grandmother of a intuitive child named Sidney, who is now nine years old. Before Sidney started school, he would stay at his grandparents’ house some weekends. They did all kinds of fun things together. One day when Sidney was with his grandmother (known as Von-Von), he kept repeating, “Hannah, Hannah, Hannah.”All day long he called the name. Yvonne said she felt like he was trying to give her a message, but she also thought he was too young to be channeling. At about nine months old, he wasn’t even talking more than a few words. Finally curiosity got the best of her and Yvonne called Sidney’s mom, Amanda, hoping to get some more information. Amanda had a friend who a daughter named Hannah. Amanda and Hannah’s mom gave birth within a few weeks of one another but they lost touch a few months later. The last Amanda knew about her friend was that she had a drug problem. Amanda and Yvonne said a prayer of protection for Hannah while they were on the phone. Amazingly, Sidney stopped repeating the child’s name after that. The next week Amanda received a call from someone who was still in touch with Hannah’s family. Hannah’s grandmother had taken custody of the child because Hannah’s mother had been neglecting the baby girl. Sidney continued to show signs of being spiritually aware. When he looked at his grandmother, he would sometimes look beside her or over her and giggle. Yvonne sensed then that her grandson was able to see in the spirit realm. That belief was confirmed one day when Sidney was about four years old. He was with Yvonne in her office when she asked him to another room in the house to get something for her. He jumped up and started toward the door. Then, all of a sudden he stopped and wouldn’t go another step. He backed up closer to where his grandmother was sitting. “What’s wrong, Sid?” she asked. “Von-Von, who is that?” He pointed toward the hallway. She intuitively knew what was happening because she had seen the spirit of young boy flash across her foyer several days prior. “I’m not sure what his name is,” she said, “but he will not harm you. Let’s call upon Archangels Chamuel and Michael.” Yvonne pulled Sid into her lap. He was still staring at the doorway. “He’s gone,” Sidney said. Then, he slid off Von-Von’s lap and walked through the doorway without hesitation. Thought I rarely do this, I want to recommend to you, The Secret History of Consciousness, by international Bestselling Author, Meg Blackburn Losey. She is the author of the smash hit, The Children of Now, as well as Conversations with the Children of Now, Pyramids of Light, Awakening to Multi-Dimensional Reality. She is also a contributing author to The Mystery of 2012 Anthology. With your purchase of this book, you will receive the FREE gift of an MP3 download “An Act of Power” by bestselling Author of “Medicine Woman”, Lynn Andrews, and the HEALING SILKS 3 MINUTE MEDITATION VIDEO DOWNLOAD and an opportunity to enter to WIN in the Secret History of Consciousness Promotion! Prizes consist of a pair of his and hers mountain bikes, an Amazon Kindle loaded with Dr. Meg’s books, a signed limited edition canvas print, as well as other prizes and books from many authors…too many to list here. Thank you so much. I hope that you enjoy The Secret History of Consciousness. I know that you won’t be disappointed! Buy Raising Intuitive Children today! Ways to Reach Intuitive Parenting today! Share what is on your mind with Intuitive Parenting. Take the Intuitive Parenting for Intuitive Kids Survey to find what you are seeking! Sign up to receive information about the Intuitive Parenting for Intuitive Kids newsletter and get five free gifts! Elizabeth on Why Do Kids See Ghosts?